Food for the body, heart and soul is sometimes found in one’s own backyard. Take inspiration from these talented, green-fingered women on how and why a little plot of love can so easily offer both nature and nurture for the family. First, know that no garden is too small! Start with easy, low-maintenance crops to build confidence. We began with long beans, roselle, white eggplants, malabar spinach, water spinach, sweet potato leaves and herbs like Thai basil and mint. Most of them grew quite well and helped build our confidence in growing our own food. Healthy, happy plants are stronger and attract less pests. It also helps to choose plants that are well suited to the climate. What you choose to grow depends on factors like growing space, the amount of sunlight your garden gets and, most importantly, what you enjoy eating. I personally love cut-and-come again crops, like amaranth, spinach, spring onions, bok choy, rocket greens and parsley. Eggplant and okra are also fairly easy to grow and with the right care, they will give you delicious, abundant harvests. I also read up on permaculture, companion planting and garden guilds (planting plants that support and grow in harmony) and slowly tweaked the garden from there. Building good, living soil is easy. With patience, you’ll be able to create soil that’s rich in organic matter which will, in turn, help you grow healthy, nutrient-dense food. You can compost almost everything, from vegetable scraps, egg shells, used coffee grounds and tea leaves ... even pet fur! If you think about it, it all makes sense: what comes from the ground should go back to the ground, to create and sustain new life. Here’s a helpful tip I found online: if you grow it for the fruit or the root, you need full sun. If you grow it for leaves, stems or sprouts, then partial shade is all you need. Even if you have minimal experience like us, you’ll learn as you go along. Try not to feel overwhelmed by the amount of information you read in books or online. Don’t forget the flowers that support the bees and other pollinators. These will, in turn, help you increase your garden’s yield. One of the main challenges for organic growers is pest management. Everything thrives in warm, humid environments. We try to minimise intervention by manually picking or simply hosing the pests off! We also plant companion plants like marigold, chives and garlic to repel them and grow a good variety of herbs and other plants to attract beneficial insects like ladybugs, bees, praying mantises and spiders. It was hard at first but now we’re used to letting nature take its course. Before you know it, you’ll notice tonnes of beneficial insects and micro-organisms helping you do all the work, from biological pest management to improving soil fertility and pollination. ZDR Sdn Bhd director Sophie Chong and Pentago principal director Wendy Khaw have known each other since 2005, having worked on projects together as architects. However, it was the planning of a herb garden in the midst of Kuala Lumpur’s concrete jungle cityscape that united them on a common mission. 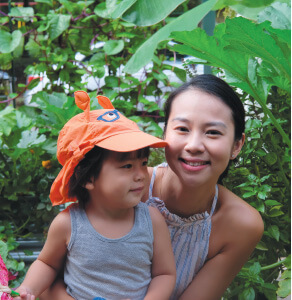 Chong, who resides in one of Bukit Ceylon’s one-tower condominium developments, starts off by explaining how the condo’s small playground had become derelict with broken equipment and filled with mosquitoes and overgrown plants. When the issue of upgrading the playground was raised at one of the condo’s management committee meetings, along came the suggestion to transform it into a herb garden. 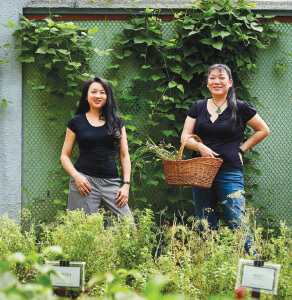 “The consensus was that it was a good idea as the concept of urban farming is important. When you buy herbs, you buy too much and you end up throwing half of it away. With a herb garden, residents can have the convenience of coming to cut whatever they need, however much they need. I asked a friend, Wendy, to help as I’m not a landscape architect and she very kindly designed a garden for us,” Chong says. Helping out pro bono, Khaw sketched a plan for the herb garden. She is no stranger to farming as her family owns a 55ha “hobby” farm that is an hour from Melbourne where they grow their own herbs for the restaurants they run there, in addition to heirloom pears and apples, vegetables and other produce. The next step for Khaw was to propose a list of herbs to be approved by the management committee and for the condo community to decide which ones they wanted from the list that they would use. In the end, it was a combination of Asian herbs like daun kadok and pegaga, and Western herbs that are more experimental to grow due to the local wet weather. Further down the road, when the garden gets more established, Khaw says the condo residents can come down to do some gardening to renew, reseed and replant as not all the herbs are permanent ones. For now, the garden is still covered by the defects liability provided by the landscape contractor for the first six months. 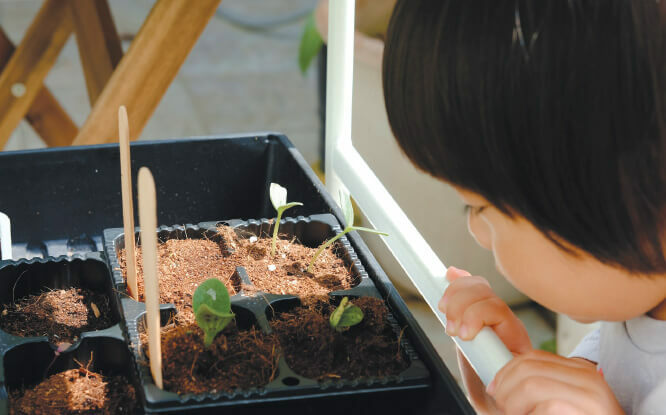 After this period, there are plans to start a residents’ community garden group to handle the garden, by which time the types of herbs may change according to the residents’ preferences. Khaw is also keen to introduce some Thai and Vietnamese herbs that are not available locally. Moving on, there is talk of extending the urban farming activity to the flat rooftop of the condominium to grow vegetables, budget permitting. Depending on how things pan out, they could move the herbs up and grow vegetables in the current ground-level garden plot. “That’s why I’m so glad I know someone like Wendy. Because it is very important to know what can be planted and where it can planted, and where the sun is coming from, and where it’s dry and where it’s wet. I found out that for pegaga, there is a big plastic sheet under where it is planted because it likes to sit in water in a very damp place,” Chong explains. Khaw says, “So when I do the design, I have to make sure we don’t put the herbs that like water with the ones that like to be dry because they are not going to grow well. In a big area like this, it is unlike home environments with one pot of herbs here and another pot there.” Chong acknowledges that the herb garden would never have materialised without the expert advice of a landscape architect, in this case, Khaw’s. Finally, having a professional landscape contractor like Desa Hijau that was willing to go the extra mile — not only to source more than 30 herbs to be planted in the garden but also to care for them with the fertilising, weeding and watering — is key. For this particular case, it was an instant herb garden as Desa Hijau helped to source grown herb plants of a certain size as specified by Khaw to be replanted in the herb garden. For plants that cannot be found, like tomatoes, Khaw brought the seeds in from Australia. The seeds are now being germinated in a nursery by Desa Hijau before being transferred to the actual herb garden. Khaw says she has proposed herb gardens to a lot of her residential clients. “There are different ways of doing herb gardens. Herb gardens do not have to look like farms and they can be very aesthetically pleasing to look at. There are so many benefits like the scent of the herbs which help ward off mosquitoes and other insects. Herbs can also be planted on balconies, whether in pots or wooden boxes. For a lot of the new apartments, from a design perspective, ornamental plants can be replaced with herbs to create an edible garden. Now daun kadok is commonly used as ground cover instead of grass as it is easy to grow.